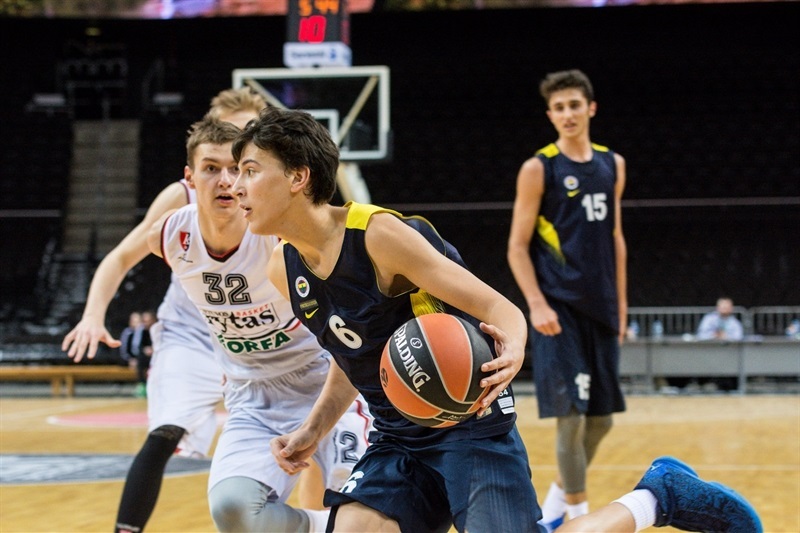 U18 Fenerbahce Istanbul played spoiler and beat U18 Lietuvos Rytas Vilnius 68-69 to keep it from being an all-Lithuanian final of the EUROLEAGUE BASKETBALL ADIDAS NEXT GENERATION TOURNAMENT Kaunas. 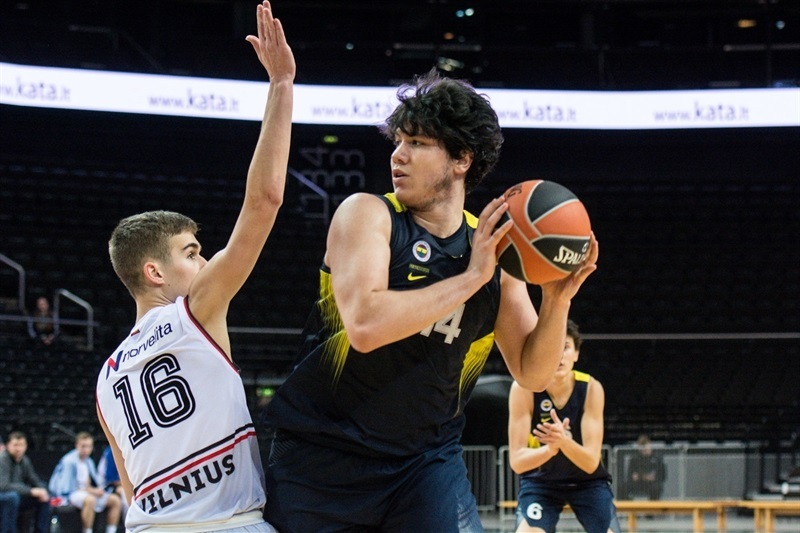 Baris Yeniay hit a tough layup with 1 second left to give Fenerbahce the win, which means that U18 CFBB Paris will face U18 Zalgiris Kaunas in Saturday’s final. Yeniay led Fenerbahce with 23 points, 6 rebounds and 6 assists, while Ahmet Duran collected 18 points, 15 rebounds, 4 assists, 4 steals and 3 blocks. 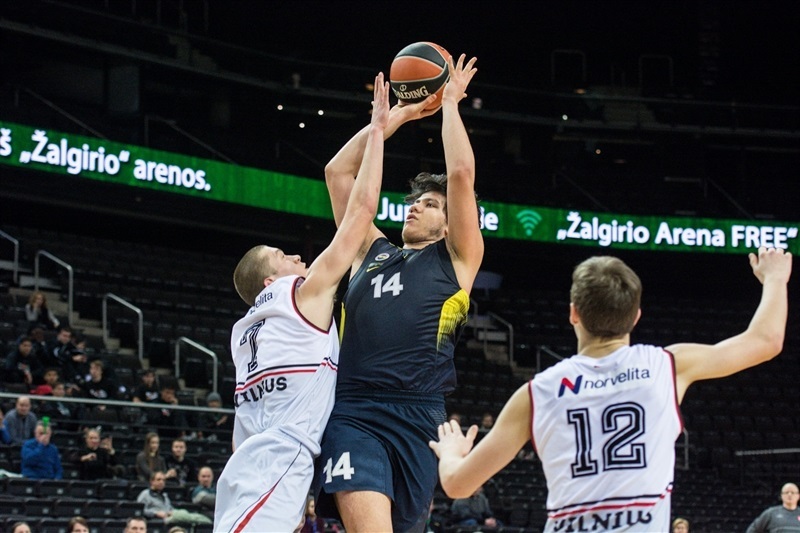 Fenerbahce, which improved to 2-1 for third place in Group A, will take on U18 Canarias Basketbal Academy Las Palmas for fifth place on Saturday. 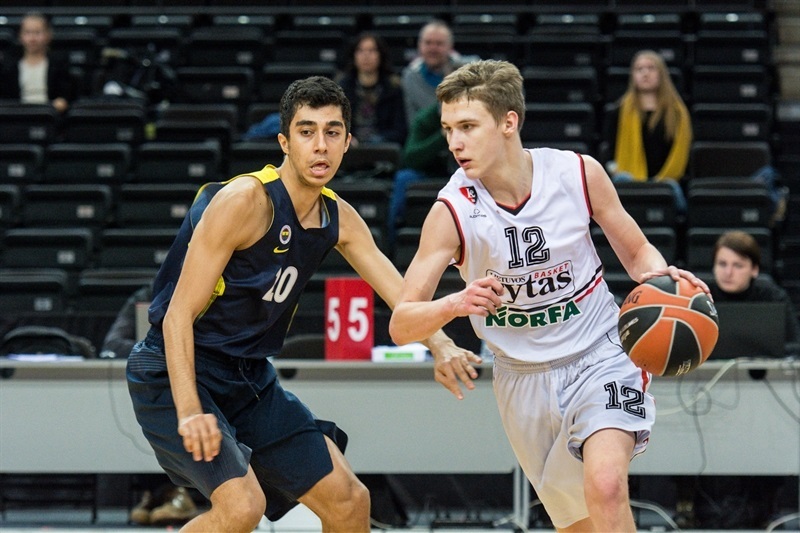 Lietuvos Rytas missed a chance for a rematch of the 2015-16 ANGT Kaunas final despite 18 points from Domantas Vilys. Lietuvos Rytas ended up in second place in Group A with a 2-1 record and will take on U18 CSKA Moscow for third place on Saturday. Mert Ilhan picked up 6 points early on for Fenerbahce in opening up a 4-13 lead. Vilys was on target twice from long range in helping get Rytas trim the margin to 12-15. Fenerbahce was up 14-20 after 10 minutes. Yeniay helped take some of the offensive burden in the second quarter with two baskets as Fenerbahce pushed the lead to 19-27. But Rytas got right back into the game with a 7-2 run, including a pair of dunks by Yauhen Massalski to make it 26-29. Tadas Vaiciunas and Paulius Poska knocked down three-pointers for the Lithuanian side, which trailed 34-35 at the break. Another Massalski dunk put Rytas ahead 39-37. 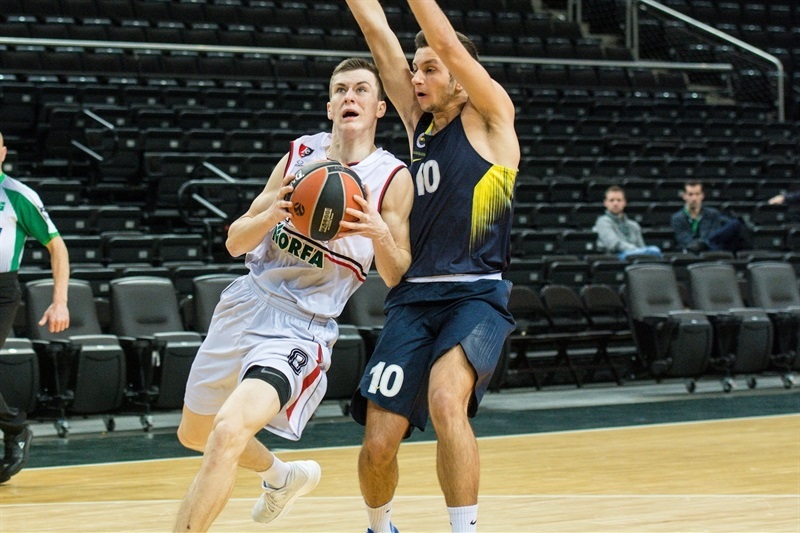 The game remained tight the rest of the quarter with neither side leading by more than 2 points with five ties and four lead changes before Rytas went up 50-48 going into the fourth quarter. 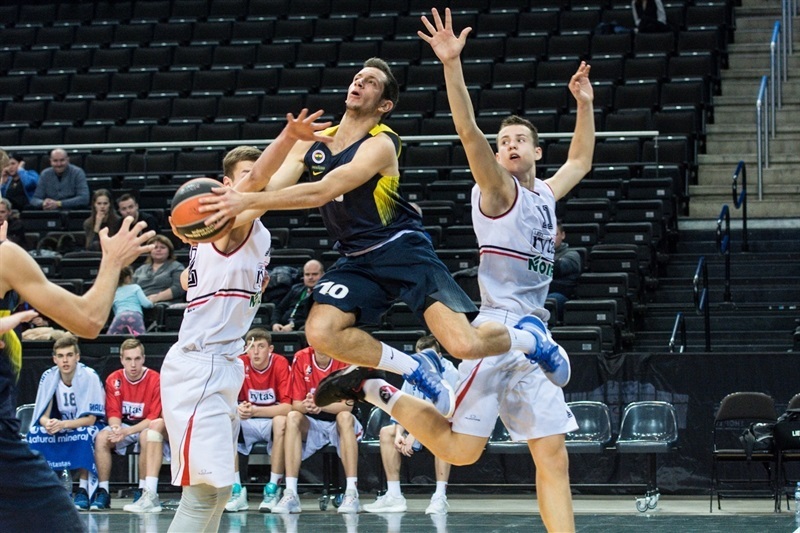 Mykolas Astrauskas opened the final frame with two baskets and an assist and Simas Jarumbauskas nailed a three-pointer as the lead swelled to 59-51 with seven minutes left. Fenerbahce would not go away and Adem Bayrak hit two baskets to trim the gap to 60-57. Another Jarumbauskas three-pointer helped increase the Rytas advantage to 64-57. But Duran nailed a three-pointer and had 3 free throws to make it 64-65 with 39 seconds left. Vilys followed with 2 free throws, but Yeniay put back an offensive rebound with 16 seconds to play for a 66-67 lead. Vilys hit 2 more free throws with 12 seconds remaining to set up Yeniay’s heroic layup.